Here's the new vector illustration I made for a guy and his truck a few weeks ago and the reason why I took awhile is the odd schedule the guy had for shipping things. So there fore there were times where he did not have access to email but the actual work for the project didn't take very long to do except for the part where I had to trace it producing the thick and thin lines of the character. 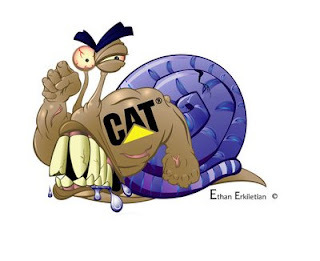 So anyways the lag at a snails pace (pardon the pun) actually wasn't a problem since it helped me relax after awhile and concentrate since I was a bit nervous about my first job at this freelance place. But none the less the results and experience were great. Enjoy!